6-30 Killarney Athletic v Killarney Celtic , Venue Woodlawn . 2-00 Kerry SBGL v Limerick Fc , Venue Mounthawk Park . 2-00 Limerick Fc v Kerry DL , Venue Hogan Park . 5-00 Atletico Ardfert v St Brendans Park , Venue Mounthawk Park Note Venue & Time Change. 2-00 Castleisland Afc v Tralee Dynamos , Venue Georgie O’Callaghan Park Moved To Tuesday April 9th. 2-00 Mastergeeha Fc v Killarney Celtic , Venue Kilbrean Park . 2-00 Ballyhar Dynamos v Tralee Dynamos , Venue Murt Scott Park New Fixture. 2-00 Killorglin Afc v Rattoo Rovers , Venue Killorglin . 6-30 AC Athletic v Killorglin A , Match Postponed. .
6-30 Kilmoyley Athletic v Manor West Fc , Venue Mounthawk Park . 2-00 Kerry DL v Limerick Fc , Venue Mounthawk Park . 11-30 Strand Road Fc v Ballymac Celtic , Venue Mounthawk Park . 11-00 Dingle Bay Rovers v Castleisland Afc , Venue Gallarus Note The Time Change. .
11-30 Listowel Celtic v Killarney Athletic , Venue Pat Kennedy Park . 3-30 CG Killarney v Castleisland B , Venue Dragon’s Den Killorglin . 11-30 Killorglin B v Windmill United , Killorglin have received a walkover . 4-00 Ballybunion Fc v CS Clochain Breanainn , Venue Mounthawk Park . 2-00 Lenamore Rovers v Ballyheigue Athletic B , Match Postponed. 2-00 Sneem Santos v Classic Fc C , Venue Sneem . 7-30 Castleisland Afc v Tralee Dynamos , George O’Callaghan Park . There will be a delegate meeting of all clubs on Monday 8-4-2019 at 8pm in Mounthawk Park Tralee. Clubs wishing to enter the Tommy Healy Memorial Cup must have their entry fee of €60 paid for on our before Monday nights meeting. 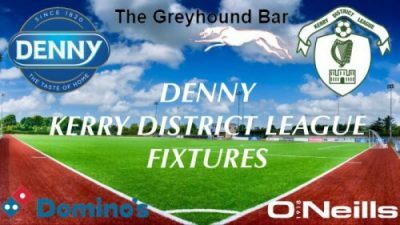 The Tommy Healy Memorial cup is only for Denny Division 2A, 2B and non league sides. We will also make the draws for the next round of all the other cup competitions .